Home > Originals > The Art of Pressing – A Descriptive Analysis. The Art of Pressing – A Descriptive Analysis. We live in the age of the “high press”. In the last decade, this defensive tactic has spread through world football, constantly being tweaked and retooled by the game’s best coaches. From its modern prophet in Marcelo Bielsa to the visionary who conquered the footballing world by combining the press with an unrelenting quest for dominating and retaining possession, Pep Guardiola, it seems every great manager in the modern game has his or her own version of a press. What does the Liverpool boss exactly mean when he compares the impact of pressing to that of a high-calibre playmaker? An inch-perfect pass is the spine of any attacking foray as it breaks up the opposition’s defensive organization and forces them to respond to a new threat at a new angle. The moment where the defensive organization has broken down is when an attack is at its most dangerous. What Klopp suggests is that while a great passer can create such moments, a high press does the same. By winning the ball back in a dangerous area while the other side is still in its attacking shape, a high pressing team can start its attack with the opposition rendered as out of sync as they would after being cut open by a perfect pass from Luka Modric. Pressure is defined as the characteristic of the space surrounding the ball which creates conditions in which the opponent surrenders control and is ultimately forced to lose possession of it or pass to some predetermined lanes by the opposition as a result of a pressing trap. In Fig. 1 ⬆️ you can see the field is differentiated into three horizontal thirds – the attacking (1& 2), the midfield(3&4) and the defensive(5&6) third. Each third is further re-divided into two horizontal halves such that zone 1 represents the high attacking press, zone 2 represents the deep attacking press, zone 3 the high midfield press, zone 4 the deep midfield press, zone 5 the high defensive press and zone 6 the deep defensive press. Teams are fundamentally set up based on where the manager wants to press in the attacking and/or the middle and/or the defensive third. One of the fundamental aspects of pressing is being able to press and establish access to the ball. The positional alignment and structure prior to a press is thus very crucial as or else the whole press fails. Fig. 2 ⬇️ highlights poor positional alignment for the press as passing lane 1 is open for the player in possession to pass to his teammate and escape the press. (a) Ignoring the ball as a reference point and collectively moving towards the space where the ball will arrive, i.e., dropping deep and narrow as the opponent moves the ball towards goal. (b) Moving collectively towards the ball and setting an offside trap. Sometimes pressing is done with the intention of coaxing the opposition to pass to a predetermined lane where upon pressing and winning the ball back whereby the defensive team will be in an advantageous position to create goalscoring chances. This is called setting pressing traps. This is a perfect instance of how through using shadow markings and arching runs, a player marks and blocks the passing lanes of opposition players. 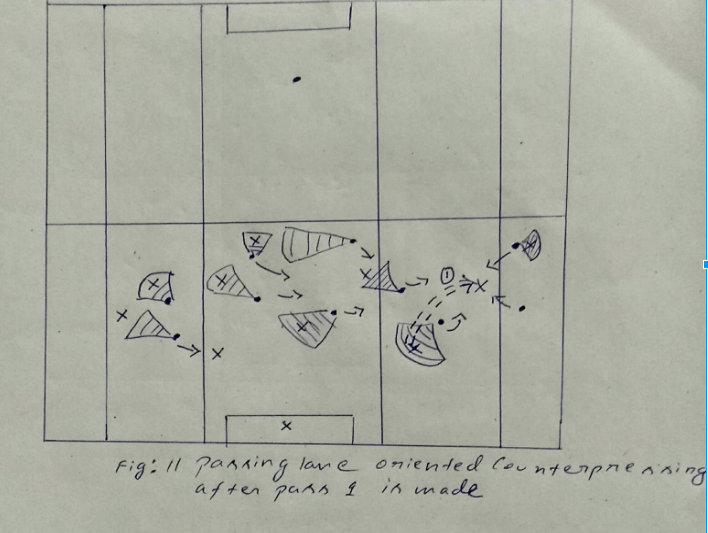 This diagram also shows how the defensive team purposely baits the team in possession through its positioning to receive the ball in zones, where it could press the ball carrier from all sides and angles with no escape route and thus win the ball and counter through the middle. 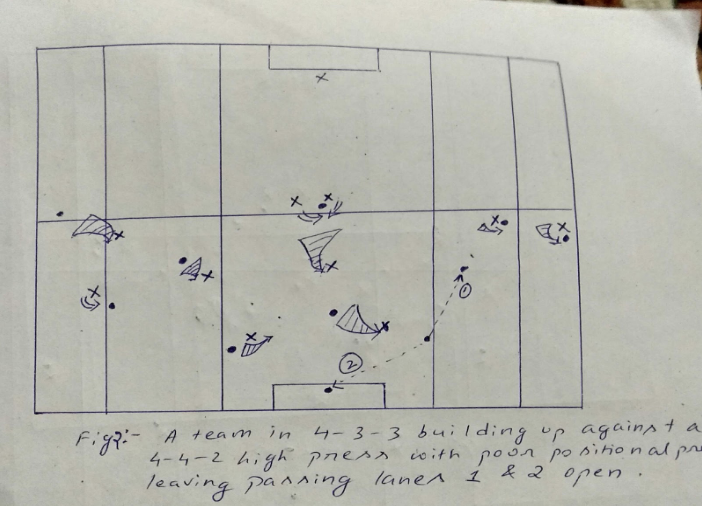 This differs from team to team as it depends upon where the defensive team wants to set the trap to win the ball and attack as per the qualities of its offensive players, be it the middle or the half spaces or the flanks. (a) If the pass receiver is facing towards his goal while receiving the pass. (b) If the pass receiver controls it poorly. (c) If the pass receiver is generally a poor decision maker and not particularly adept on the ball. (d) If the pass is under hit. So the pressing triggers mainly depend on aspects like field of view, control of the ball, ability of the player, connectivity of the opponent and nature of the pass. If the defensive team is seeking to press high up the field and towards the center, generally the wingers begin the press with arching runs towards the central defenders while blocking passes to the flanks. If the team seeks to press from the midfield towards the flanks, then the winger and full-backs begin the press against the touchline. When to stop the press is also important. The press should not be in play when access to the ball is lost. This is because when the ball is forced deeper than the pressing team is willing to move and is in an area where the pressing team feels comfortable not pressing. The direction of the press can be horizontal, vertical and even diagonal depending on the compactness of the opposition team. Backwards pressing is an effective tool when the player chooses to the press the player with the ball from his blindside, even though the ball has already past his line of press. 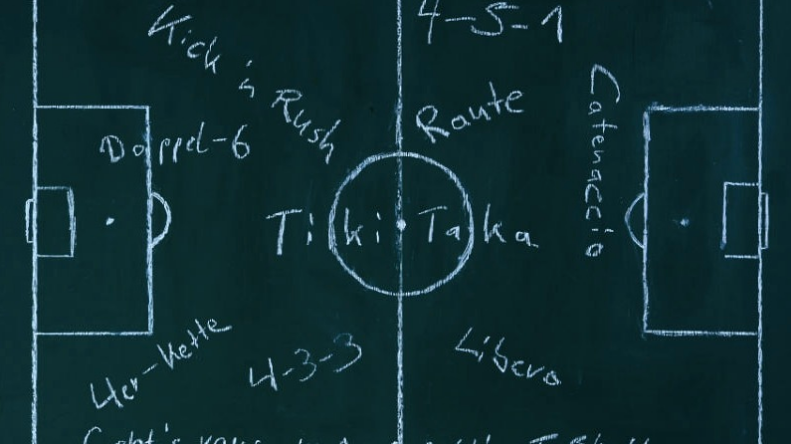 For example, in a 4-4-2 system, if the ball passes the forward line of press and yet one of the frontmen chooses to run towards the back of the player with the ball to press him, then that is called the backward press. It yields higher chances of success as the ball holding player usually remains unaware of the onrushing presser. (a) Rigid man marking Fig. 4 ⬇️ – In this system, each player chooses an opposing player and presses him relentlessly, following him wherever he goes. The idea is to have constant access to the opponent’s space, wherever he is positioned. The flaw in this philosophy lies in the fact that each opponent is followed so the pressing player becomes reactionary and thus, his positioning and movement can be easily manipulated by the opponent by dragging him or switching positions with others. 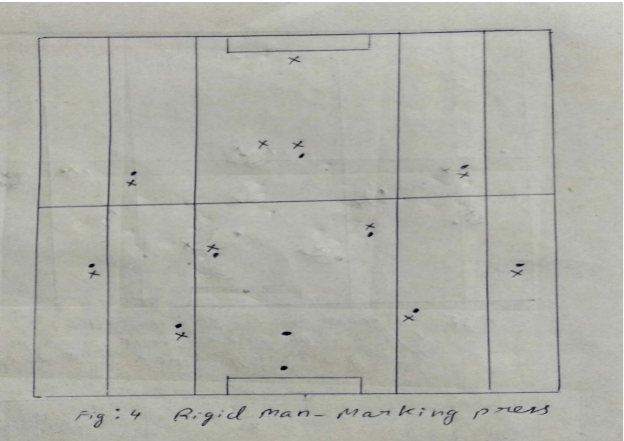 (b) Flexible man marking – This type of system is exactly similar to the earlier one, except that players (pressers) can switch off players (opponents) to each other whenever dragged or whenever there is a switch to prevent disorganization. 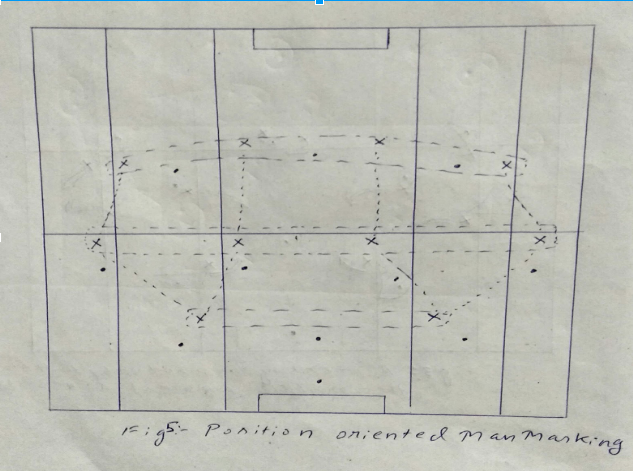 (c) Space-oriented man marking – In this system, the pressing team is focused on protecting a specific space around their position and if any opponent moves into that space, they will be aggressively pressed. Once the opponent player leaves that space, the presser returns to his starting position. The idea here is to press the opponent with the ball while the rest of the team closes down the available spaces. The weakness in this system is as only one player steps up to press in his spatial zone, he can easily be bypassed by numerical overloads of the attacking team. (d) Position-oriented man marking Fig. 5 ⬇️ – In this setup, the players remain in their position and shape in relation to their teammates and shift towards the ball. There is no active pressure on the ball carrier, but rather a space controlling around the ball by shifting towards it in a block. Only when the ball is played into the tight spaces inside the block, the team would aggressively press to win the ball. 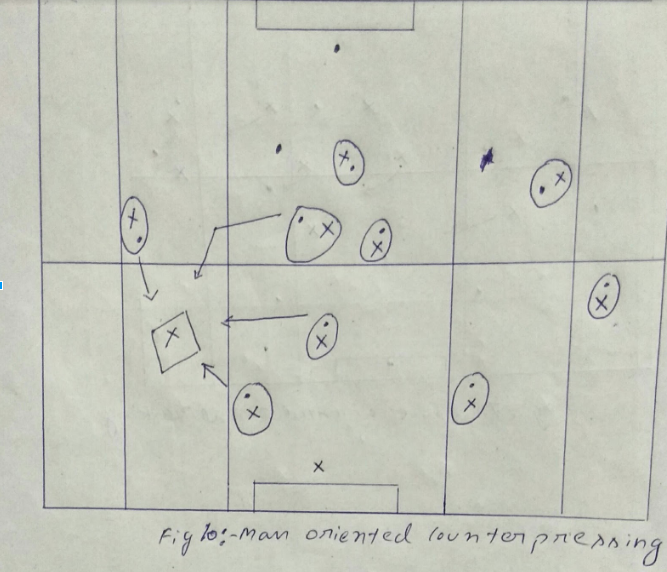 (e) Man oriented zonal-marking Fig. 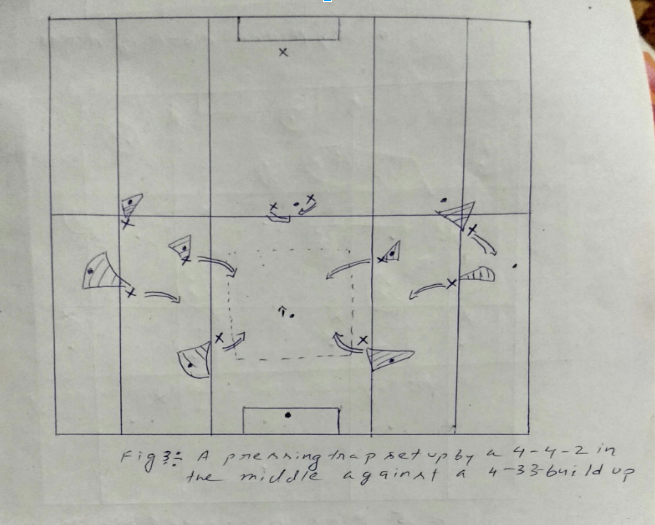 6 ⬇️– This system is largely similar to space-oriented man marking, barring the fact that the pressing players cover and protect their respective zones while moving closer to the player in possession in their zone without engaging in uncompromising pressing.The difference between the two systems is that in man oriented zonal marking, the opponent player and the space around him space is primary, while space oriented zonal-marking prioritizes the reference point and space around the ball. 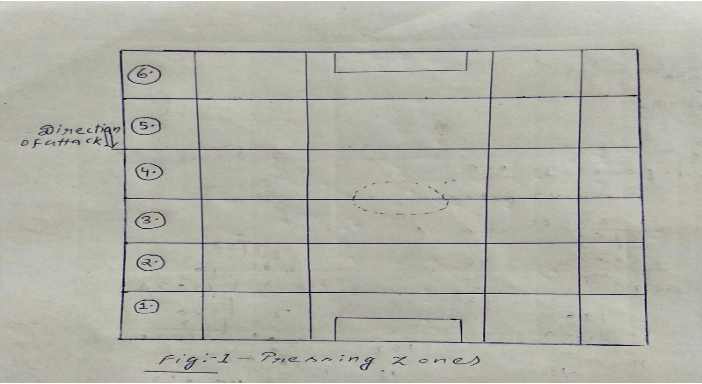 (f) Space-oriented zonal marking Fig. 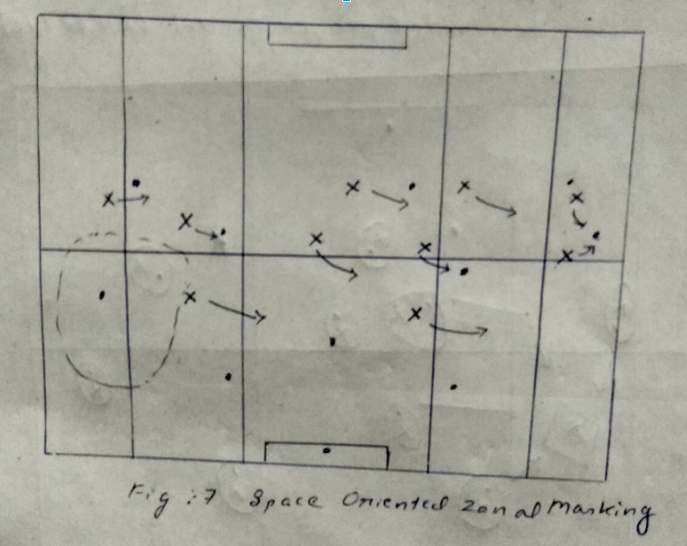 7 ⬇️– The basis of this philosophy is that the available space around the ball is congested to put pressure and also limit the opposition player’s passing options. The key to it is for the pressing team to approach the ball-retention process in a way to prevent any possible switch in the underloaded space on that pitch as otherwise, the system fails. 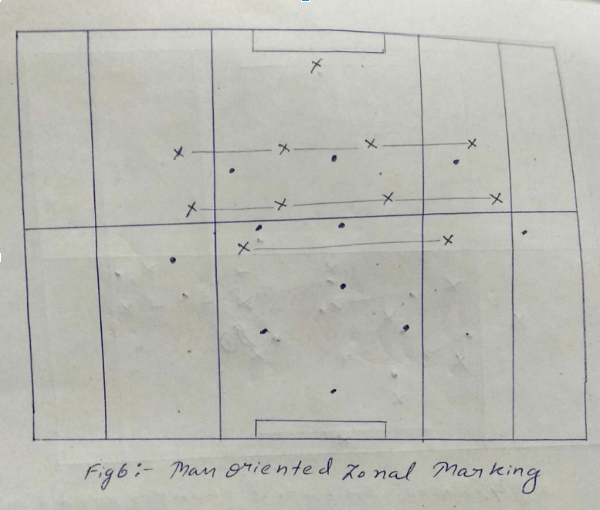 (g) Option oriented zonal marking – The main point of reference in this system is the ball and depending or predicting on where it can go, the team moves flexibly in relation to each other to prevent the ball progression. This requires great intelligence and coordination as it can involve a blend of man marking, zonal marking, blocking passing lanes, space control, etc. Pressing allows a team if executed properly to control the rhythm of the game. The defensive structure is what the offense tries to break and to do so it accordingly structures itself. So technically, pressing if applied smartly can cause the team in possession to alter their shape, positioning and structure in order to evade it. Thus, it can be subtly used to control the rhythm of a match. Counter-pressing is pressing the ball in transition from offense to defense with an active attempt to move the cycle of the phases of play in the opposite direction. 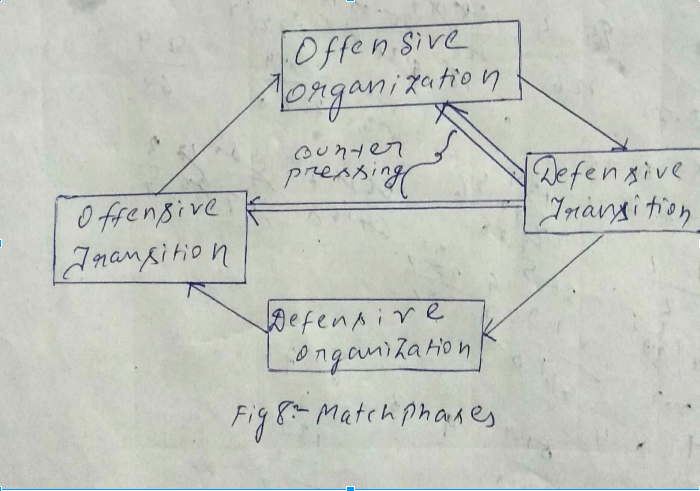 It is a match control tool that allows the team to skip the defensive organization phase and rather force the opposition to transition defensively and thus render them vulnerable. It replicates the role of a brilliant playmaker. If the counter pressing team wins the ball in its defensive transition successfully from the opposition who were about to be in an offensive transition with it, then in such a case the team that loses the ball will lose its shape. 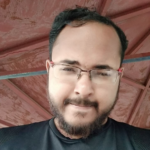 As the side was going to attack, prior to surrendering the ball, and hence that would also be the perfect situation for the ball-winning team to hit them on the break with a brisk counter-attack. An important aspect, just like in pressing is positioning for counter-pressing. If the team in possession positions themselves in strategically important positions prior to losing the ball, then they would be in a better structure to counter-press and win the ball and initiate attacks. Thus, poorly positioned teams upon losing the ball react to how the opponent shapes their attack rather than determining how they shall foray forward. Counterpressing emerges as an effective tool in controlling the tempo. The basic idea of positioning should be to occupy small spaces of the field in a compact manner while remaining as far from each other as possible and yet maintaining connectivity with the area. When the opponent wins the ball, they should be forced away from the center of the field and towards the touchline or backwards, limiting their space, ability to turn and also reducing their passing options. This causes the transition to take longer or the ball to be won back. (a) Space-oriented Fig. 9 ⬇️– In this system, the available space around the ball is congested very quickly, thus cutting off passing lanes simultaneously. By suffocating the space around the ball, a turnover is forced. The most ideal proponent of this ideology is Jurgen Klopp’s implementation at Borussia Dortmund and now, Liverpool. (b) Man oriented Fig. 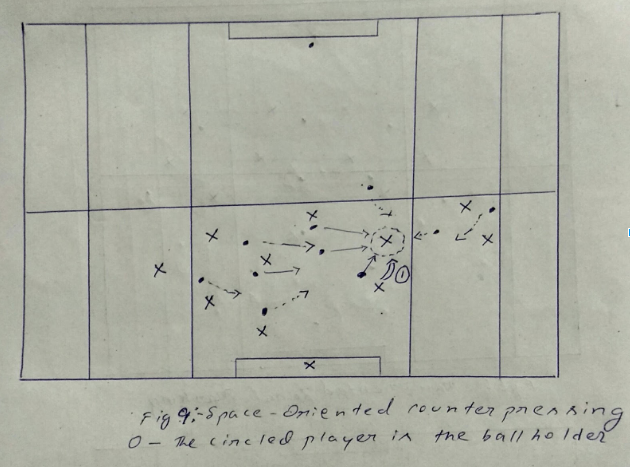 10 ⬇️ – Under this setup, the defensive team presses the player with the ball with one or two players, while the rest of his teammates man mark each of the opponent players that act as potential pass recipients. In this system, the defenders always have access to the opponent, meaning they can directly challenge for the ball every time. It allows more space around the ball but leads to many more challenges and duels. It fits teams like that of Jupp Heynckes’ treble-winning Bayern team who were excellent in challenging for the ball. This, however, becomes disadvantageous when the opponent has excellent skilful 1v1 players. (c) Passing lane oriented Fig. 11 ⬇️ – In this type of system, the opponent is coaxed into playing a pass into an open lane, before intercepting the ball. Thus, one passing lane is left open by the pressing team for strategic reasons. The open lane is such that it becomes easier for the pressing team to press the ball receiver from all angles in that lane and win the ball back as well as attack immediately. This type of counter-pressing is prevalent in Guardiola’s teams. (d) Ball oriented – Pressing is focused solely on the ball, under this philosophy in which all the surrounding members of the pressing team press the ball without focusing on the ball holding player’s options. This system is suicidal if the ball holding player is a good dribbler or has an excellent passing range and vision as the pressing team leaves acres of spaces on the other side of the field. 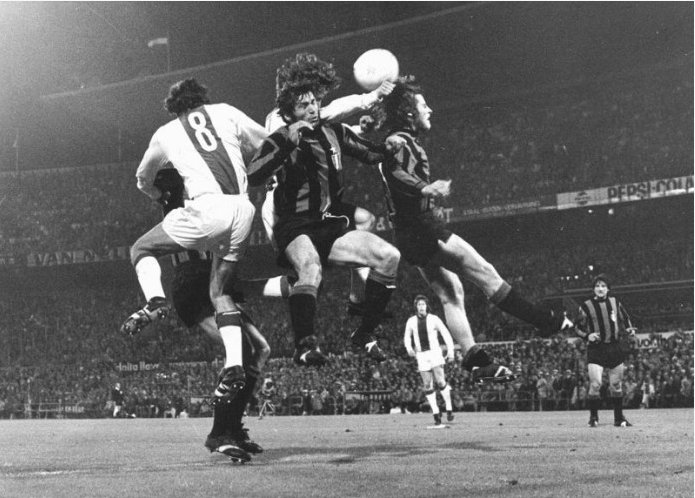 This school of counter-pressing was a large feature in the Dutch teams of the 1970’s. Counterpressing is thus a great tool that varies largely from team to team, depending on which team chooses to press how and for how long and in which parts of the field. Positioning is thus one of the most important aspects of the game, irrespective of which phase of play a team is currently playing in. Good positioning allows an attacking team to lose possession of the ball and continue to be in the appropriate spaces to start a counterattack and put the opposition on the backfoot.